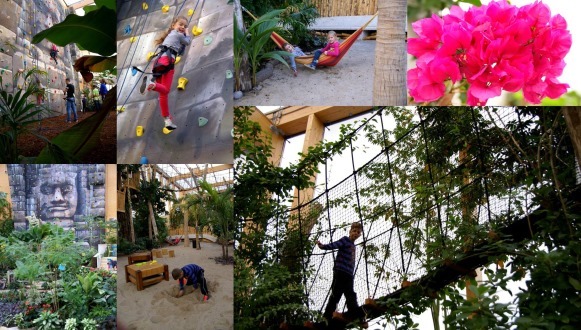 DaysOut.NL - Dive into the tropics at Omnium Goes reviews and trip information Goes zeeland. Visit the website of Dive into the tropics at Omnium Goes. Subtropical, that is what Omnium Zeeland is. You won't just find a subtropical swimming paradise, but also a tropical forest, the bananas and coffee beans grow on trees! Every day a guide can take you on a tour through this dynamic nature. This is how you'll discover many trees and plants from the tropics that we use in our daily lives. After this adventure you'll take a dive in the pool, which has a lazy river and two slides. Endless fun! A day of swimming is fun for everyone. Playing around in the recreational pool, until the white water pulls you along, through the tropical forest. At several places you look up and see the forest! On your way you'll enjoy a tropical shower. The little ones have their own place in the swimming pool. They play safely in the toddler pool with playground equipment. Come and have swim! In the tropical forest every new season brings new products. Taste all different kinds of fresh coffee and make syrup of sugar cane, or check out the carnivorous plant. All over the forest are parts of his story with information about crops. Learn more about the sweet potato or different kinds of species and herbs. At the Skywalk you can take a good look at the forest and on the Maya-climbing wall daredevils get to 10 meters up in the sky. Need a rest after all this effort? Visit the Cuban forestbar! Four big sports halls are part of Omnium, including squash courts, dancing halls and a gym. Bij Omnium horen ook vier grote sporthallen met squashbanen, danszalen en een sportschool. This attraction Dive into the tropics at Omnium Goes in Goes is suitable for corporate activities, childrens party (vanaf € 12,00 p.p.) and weekend break. Ask a question Dive into the tropics at Omnium Goes or ask an offer. Telephone: +31 (0)113 23 33 88. During the weeks there's a reduced tariff. Tip: choose the combination card tropical forest and swimming pool for 11,50 euros per person. Childrens Party: from € 12,00 per person. Accessible for Disabled.. Facilities consist of: In het zwembad is een badlift en er zijn speciale omkleedruimtes voor mindervaliden. Data last checked on 26 januari 2018, disclaimer. Open all year round (watch the opening days). From 10:00 o'clock To 21:30 o'clock. Note: Opening times are for the subtropical pool. On Saturdays and Sundays opened from 5:30 PM. Tropical forest is opened every day from 10 AM. Visit the website of Dive into the tropics at Omnium Goes or ask a question. Date of visit: 16 februariHeerlijk gezwommen in het Omnium in Goes, glijden van de glijbaan. Bubbelen in het bubbelbad. Ontspannen in de lazy river. En nog even in de stoomcabine. Date of visit: 24-06-2017Kleine badkuipjes defect, zonnehemels, geen bar personeel in het tropisch bos. Bij melding hiervan geen passende reactie; manager vindt dit normaal. Wij niet voor deze toegangsprijs!